Over 70 Tuff Spot Tray ideas – all in one place! Small world themes created within the Active World Tuff Spot Tray are ideal for sparking imagination and play. 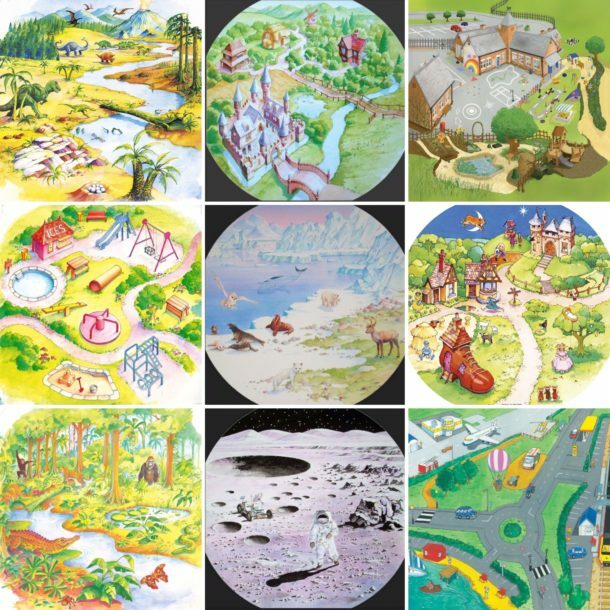 Add a themed mat to the base to give you a great start to creating your own small world. 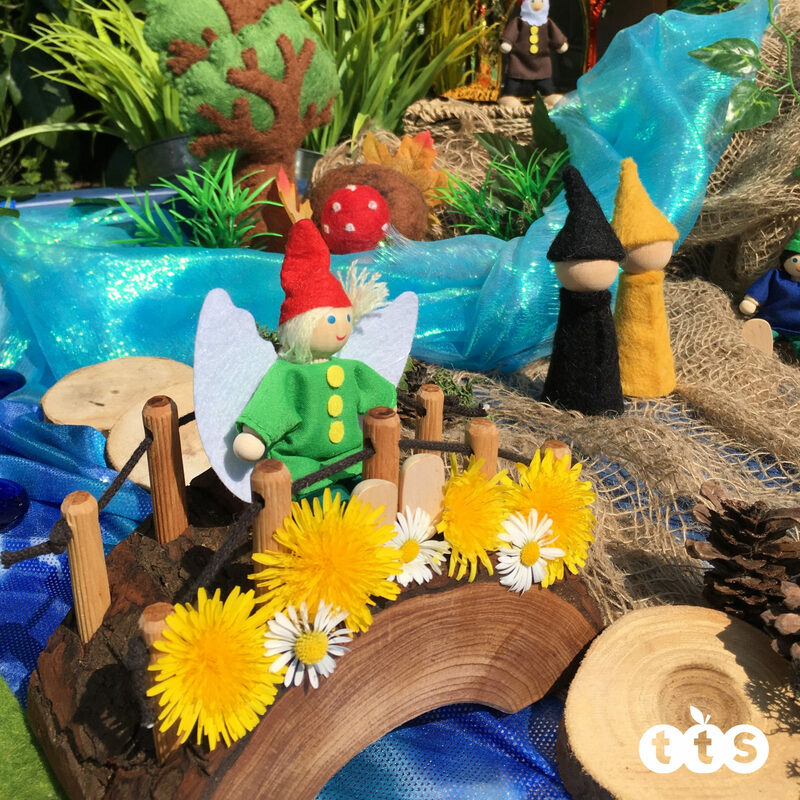 Mats help spark the children’s imagination; with a few extra props, children love recreating stories they have heard before or making up their own. 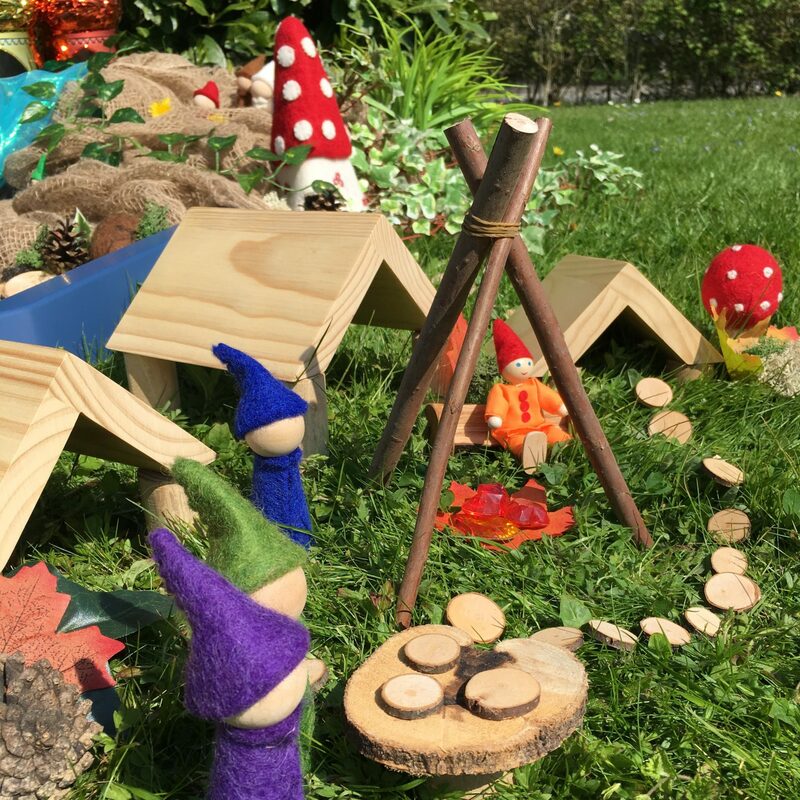 Simply transferring your farm to your Tuff Spot Tray and adding a few natural materials like logs, sticks and stones from the outdoors will help make your small world play truly magical. 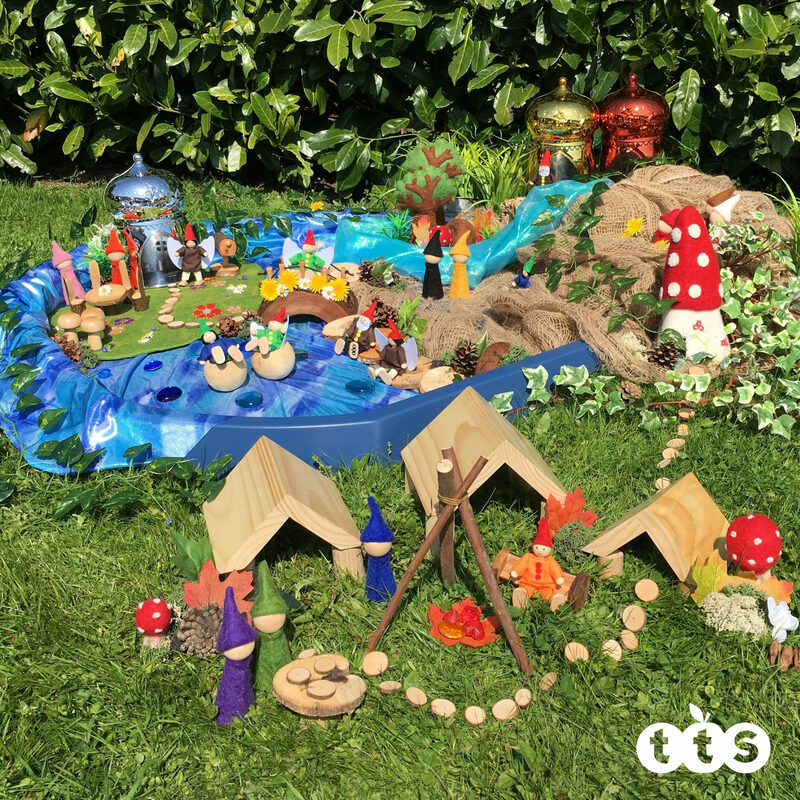 Below is a beautiful fairy and elf small world village in a tuff spot. 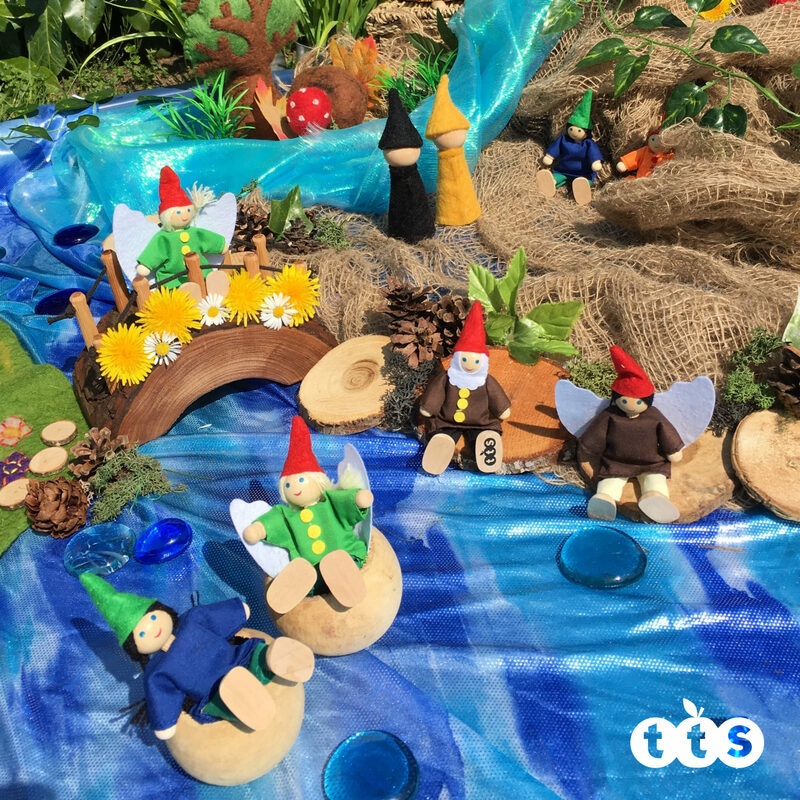 With felt fairies, Mushrooms, wooden accessories, blue shimmer materials for water and hessian. Metallic fairy houses, plastic ivy and flowers and glass pebbles. 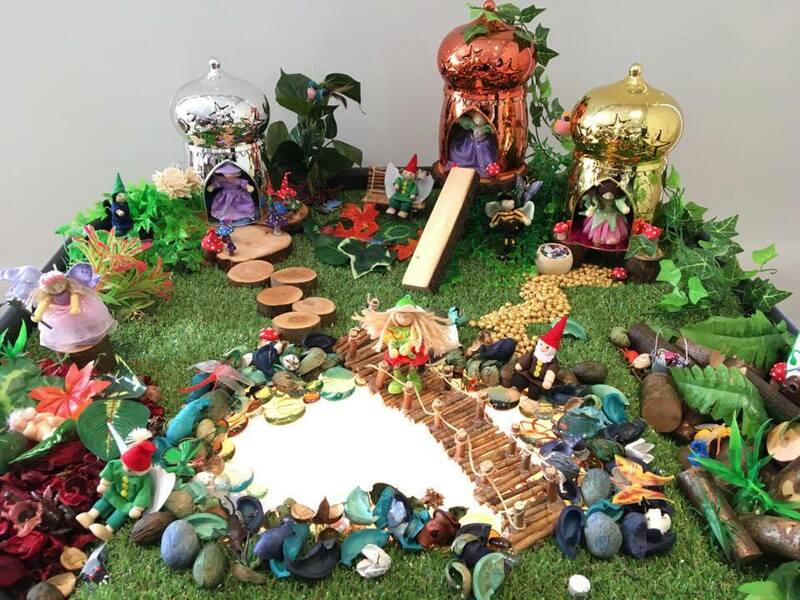 Get really creative and create scenes from a Magical Fairy and Elf Wonderland – by the wonderfully talented Clare Wilson as featured on her Tuff Spot and Sensory Play Facebook page. 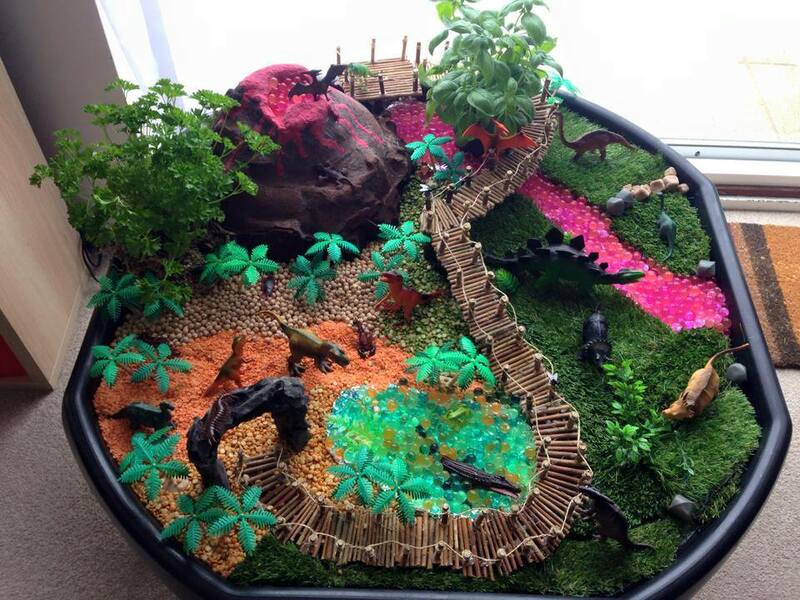 This wonderful jurassic park themed dinosaur land, also by Clare Wilson, has artificial grass, plastic plants, a lovely handmade walkway and volcano, water beads, split peas and lentils to make a real sensory tray. You can add your own dinosaurs too. 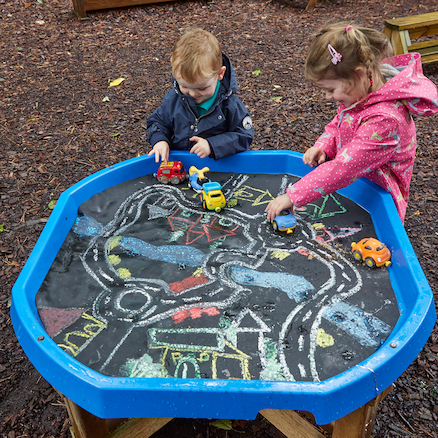 This simple tray just includes mud and stones – the children can then add their dinosaurs and get stuck in! 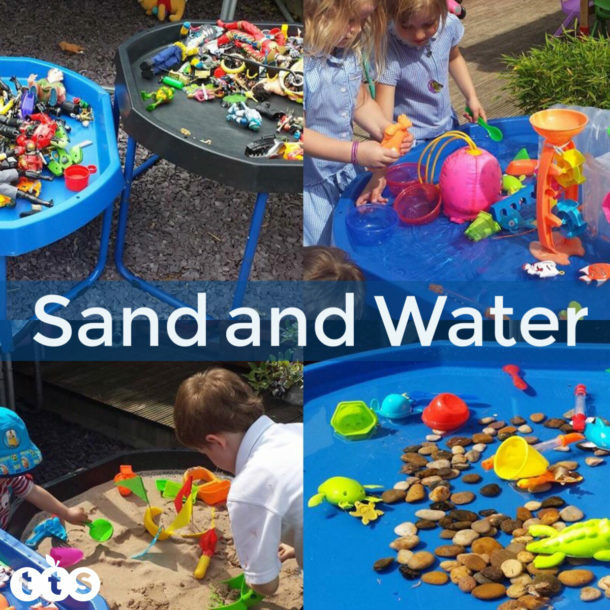 Add water to make a real messy land! Why not build mountains and valleys with the mud? The easiest way to start is to look through your cupboards at home or in your setting and find what needs using up! Cereal and pasta (cooked or uncooked) can be a fantastic play resource for babies (as long as it is well supervised). 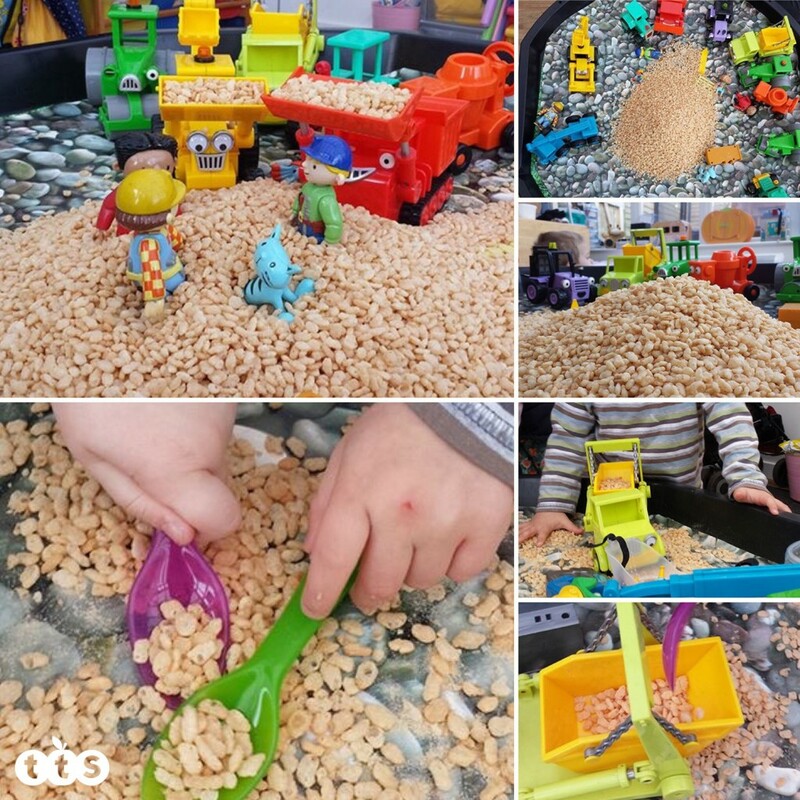 Mixing different types of cereal and pasta allows babies to explore a range of textures with their hands. Cooked spaghetti can be used to hide objects for children to find. You could also add food colouring to the water while cooking your spaghetti to change the colour. Be careful to avoid pulses as these can be toxic if consumed when they are uncooked. Children are fascinated by mirrors and their reflections. Try a plastic mirror insert in the bottom of your tray – could it be a magical lake? There are many resources available to complement your reflective scene – you could try Mirror Pebbles, Metallic Boulder Blocks and Jewels. 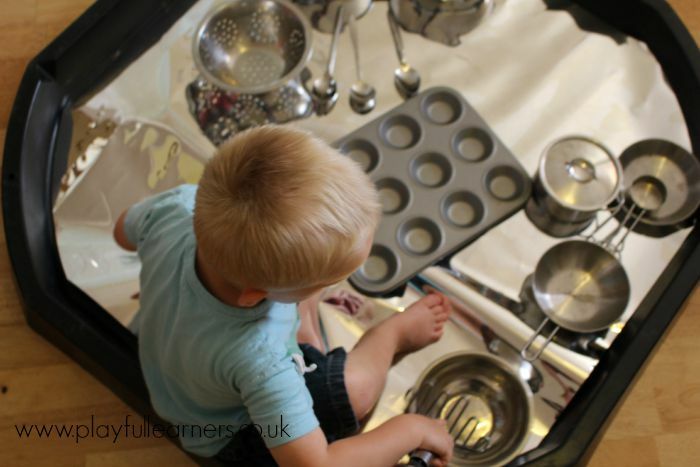 Children love to use other reflective resources such as pans, spoons and foil blankets and materials – they instantly grab their attention. 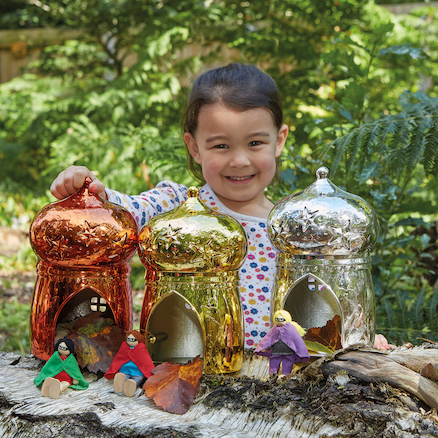 The mirror inserts make a lovely base for collections – experiment and explore with shiny and wooden spoons and wooden accessories. 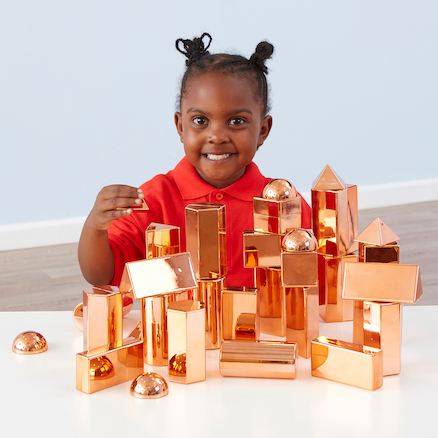 Add marvellous metallic construction blocks and pebbles to create a real reflective world. A simple and popular use for the tray in settings is to fill the tray with play balls. 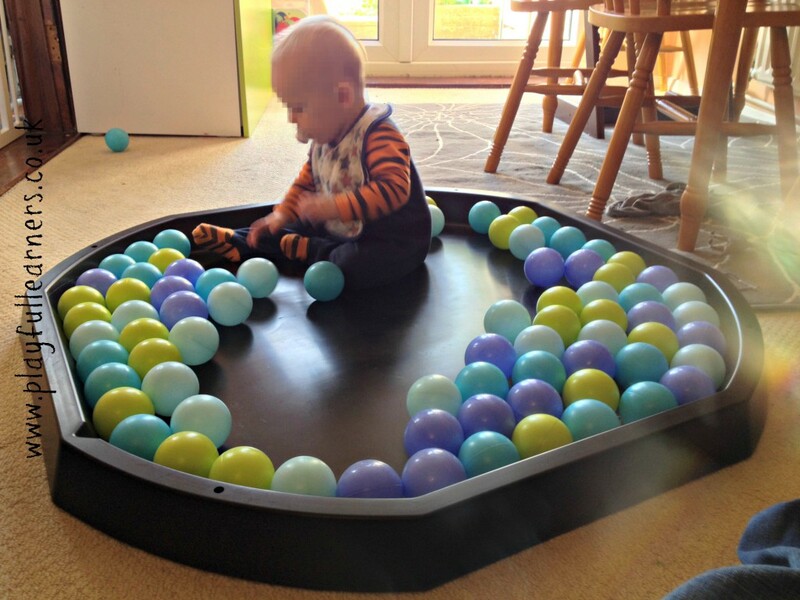 Children as young as 8 months love to sit in the Tuff Spot Tray amongst all the colourful balls. 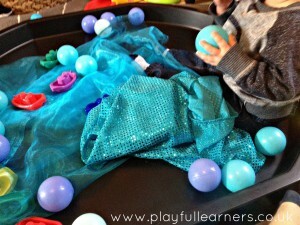 The balls will often end up all over the room but toddlers can help fill the tray again and often enjoy hiding objects for each other to find. 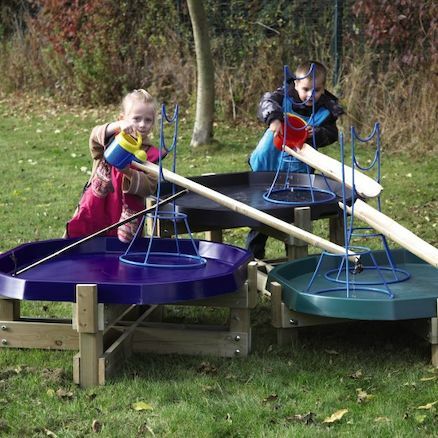 Active World Tuff Spot Trays can be filled with resources that will support and enhance a child’s schematic interests. Fill the tray with items that are aligned to the rotation schema such as rolling pins, balls, vehicles, items with lids and spinning tops. 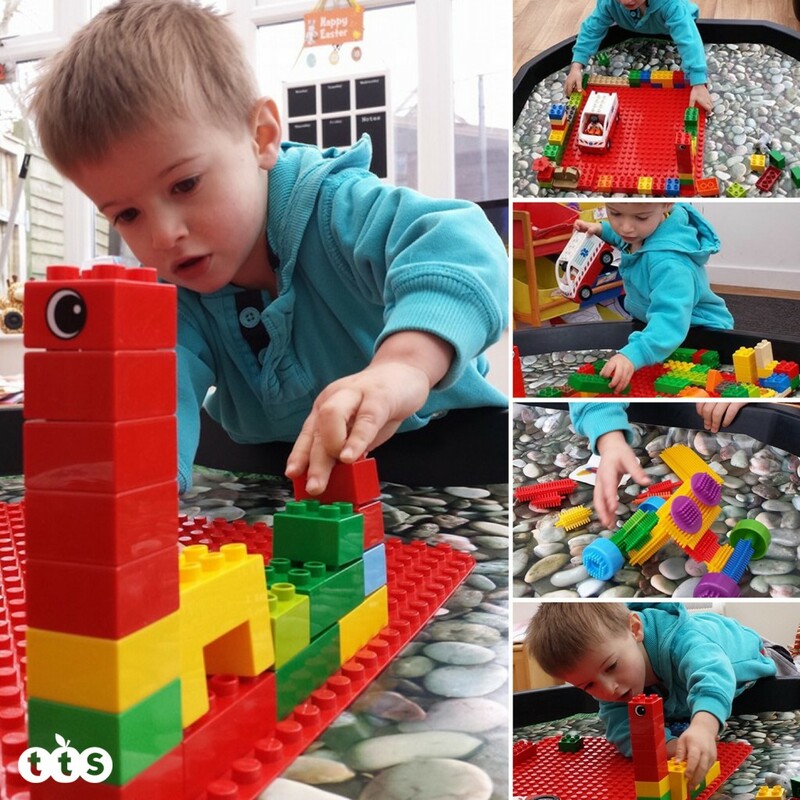 Add building bricks and construction sets to allow children to create structures, containing them in the tray, without being knocked over or damaged. 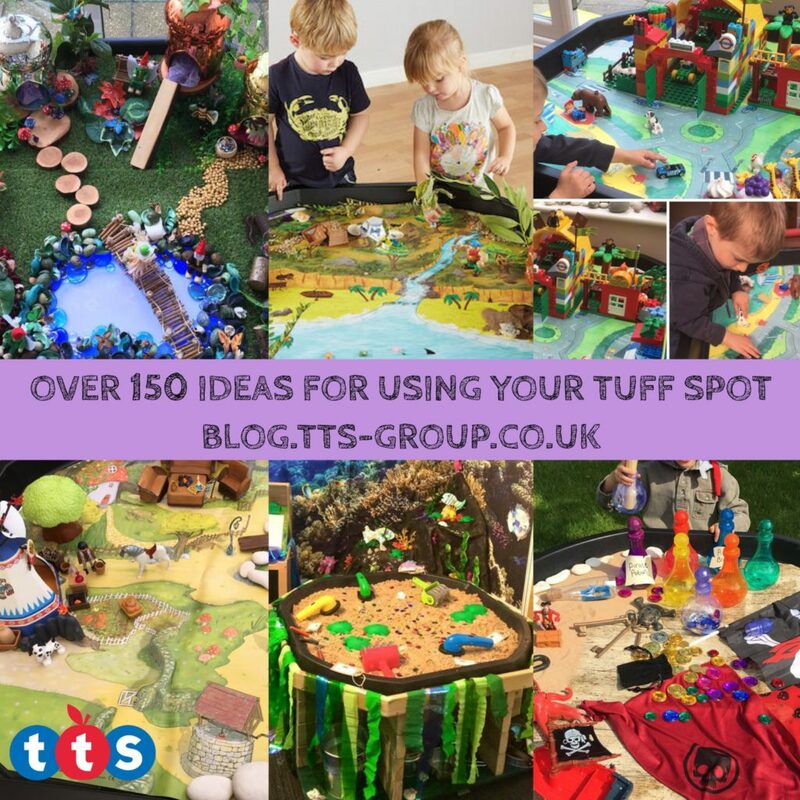 If your child is interested in transporting, enveloping and containing, make collections of interesting and varied items for them to explore and place in the Tuff Spot Tray. Why not try a chalkboard mat in your tray? 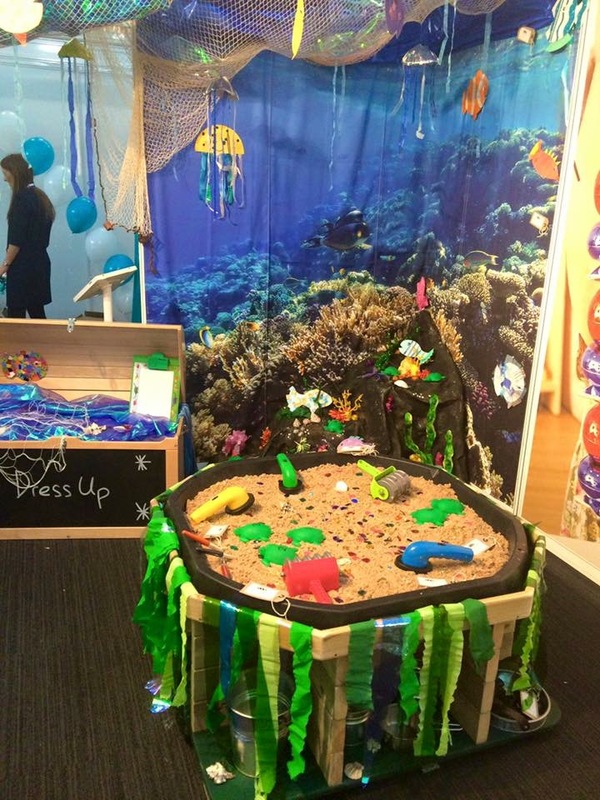 This open ended and versatile mat encourage children to create their own scene. Simply roll up when finished and the design can stay intact for its next use. 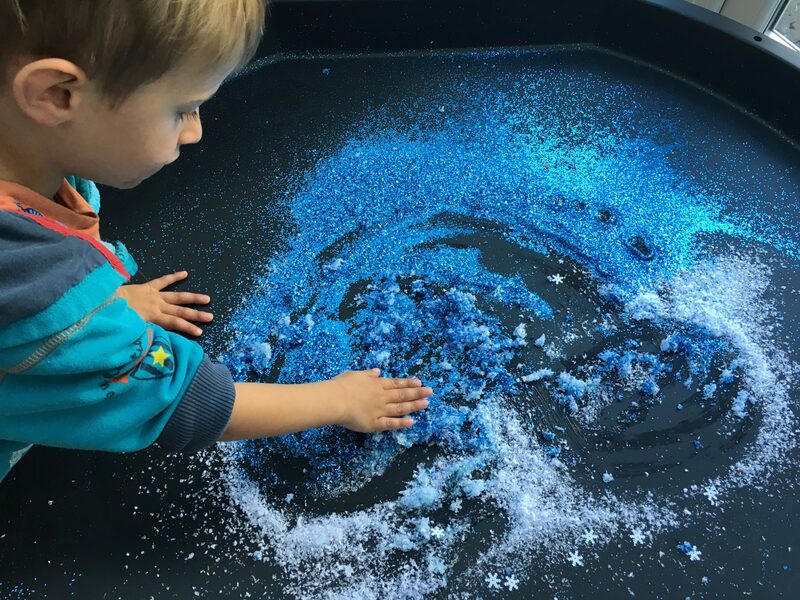 Try adding different sensory materials such as crazy soap, soap flakes and cornflour mixtures. 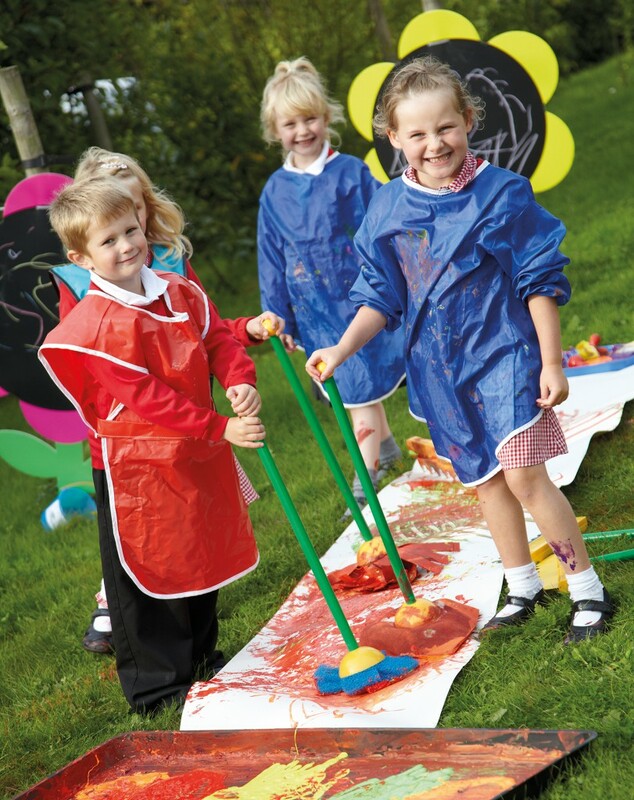 Children can mix, swirl and make marks including letter and number formations. 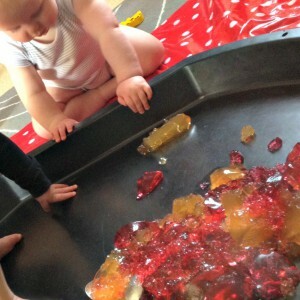 Children love exploring jelly. 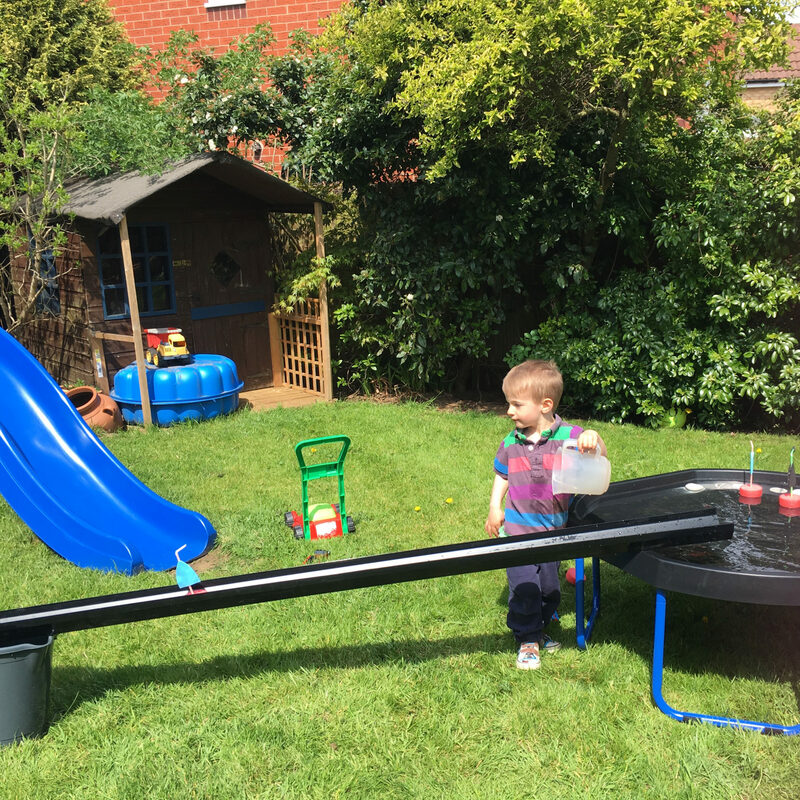 They can explore it from inside the tray or outside depending on their confidence level with sensory materials. 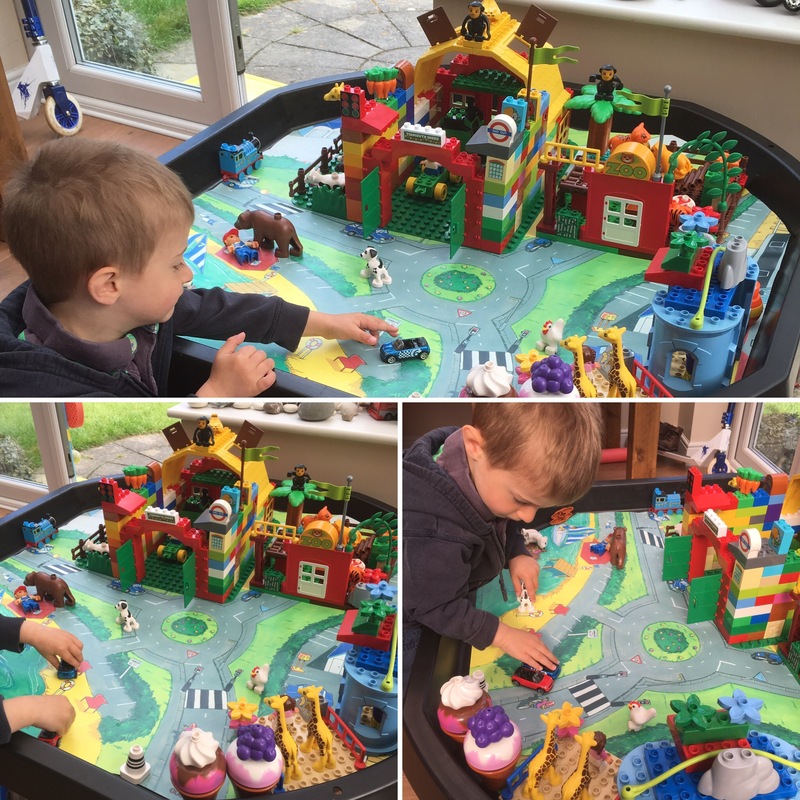 Hiding toys in the jelly helps to keep children’s attention – include objects to support the different themes you may be covering on different days. Always ensure children are well supervised at all times. 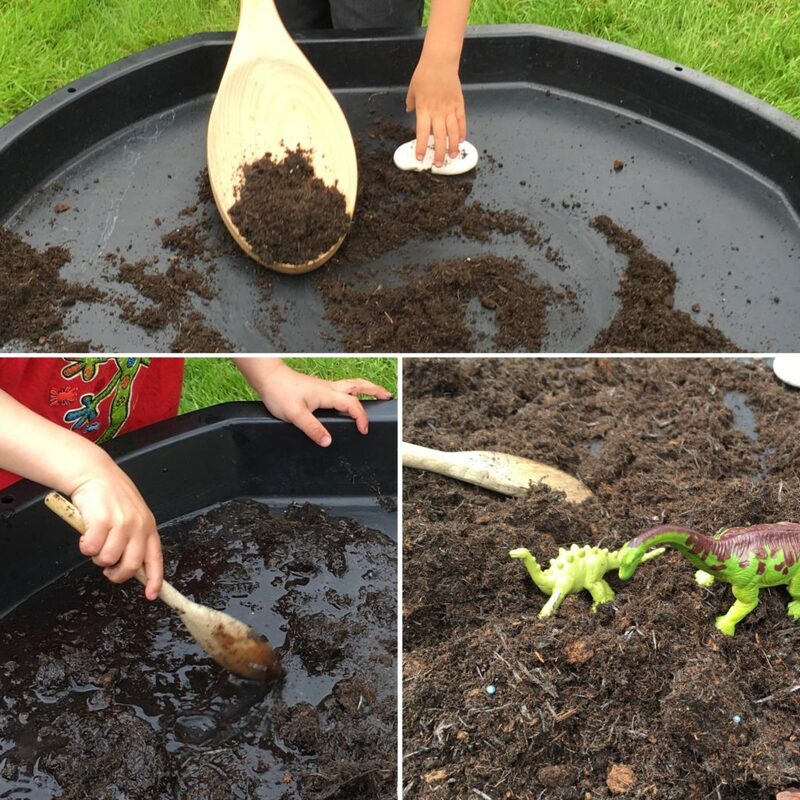 Try adding different textured materials for sensory play and bury items underneath for children to hide. Try mark making in glitter too! 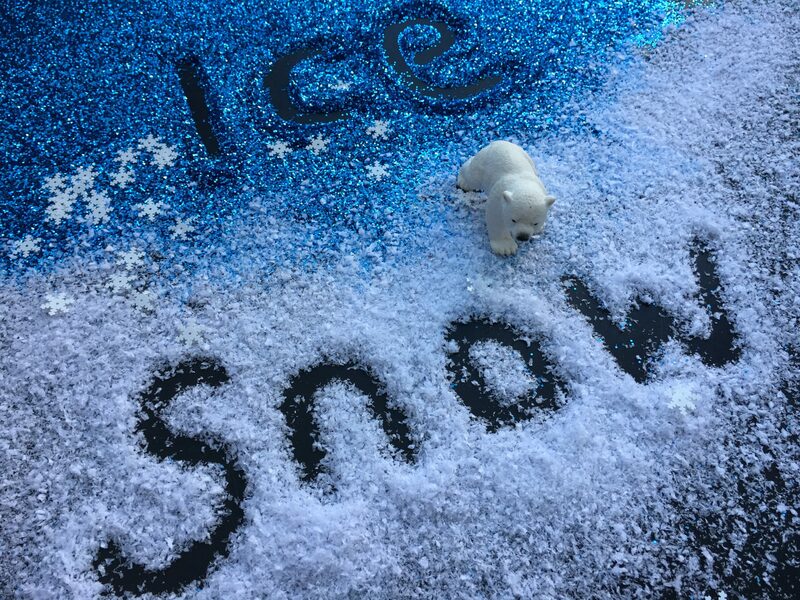 Add snowflakes and white confetti for a wintry feel. Cut up white packaging to create a white tray liner and then cut tiny scraps as confetti. Instant Snow is also fab for tuff trays! The trays are perfect for holding Sand and water. 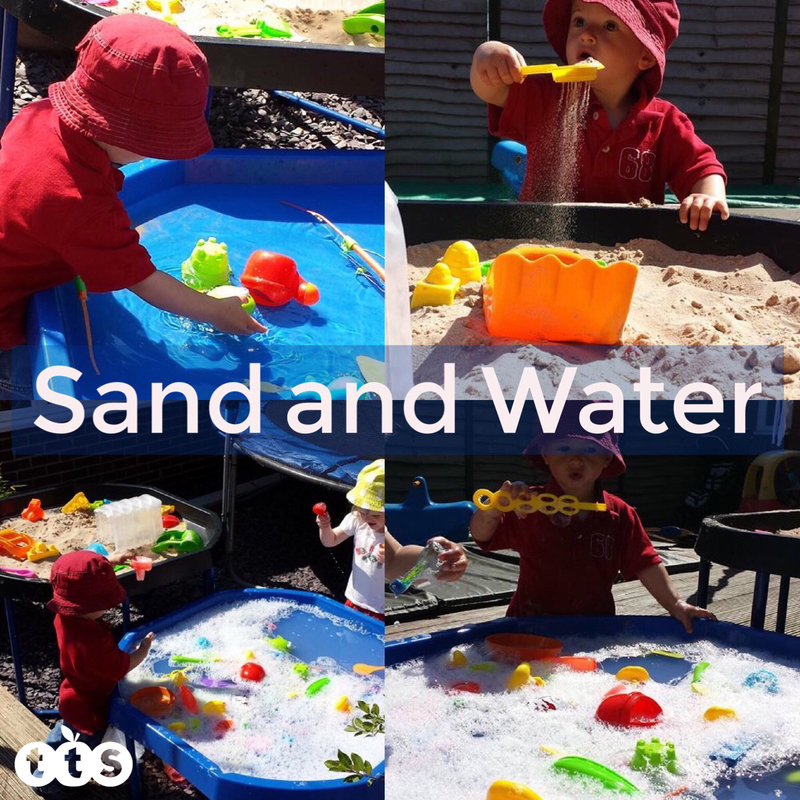 Take them outside and use on the ground or on height adjustable stands for some messy and sensory play, using bubbles and boats in the water, and buried treasure and metal detectors in the sand to incorporate ICT into the play! 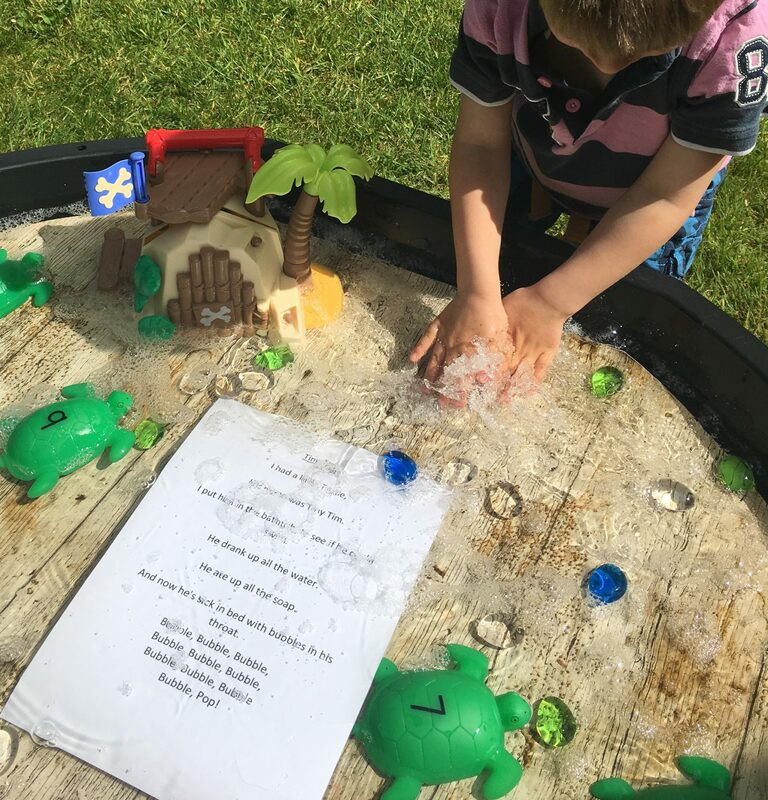 Fill the tuff spot tray with sand and add Squidgy Sparkle Letters or Number or shapes to the sand – which letters can the children find – can they identify each one – can they find enough letters to make a word? 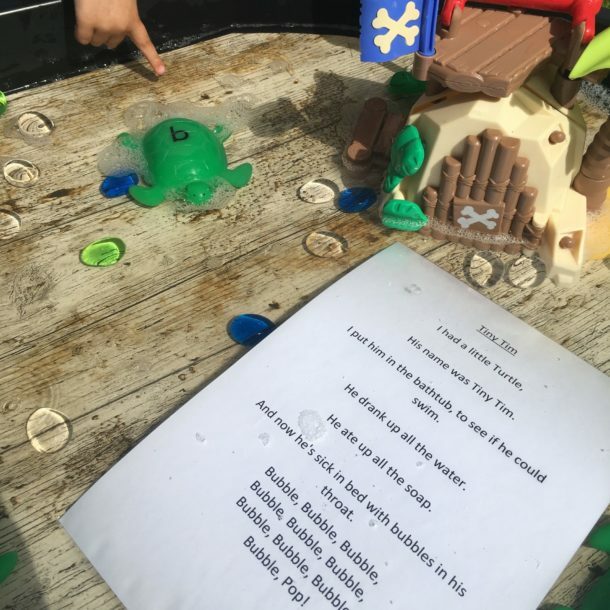 Create a turtle tuff spot with our talking turtles. Fill a tuff spot tray or similar with a water and bubble solution and place a laminated copy of the song inside. 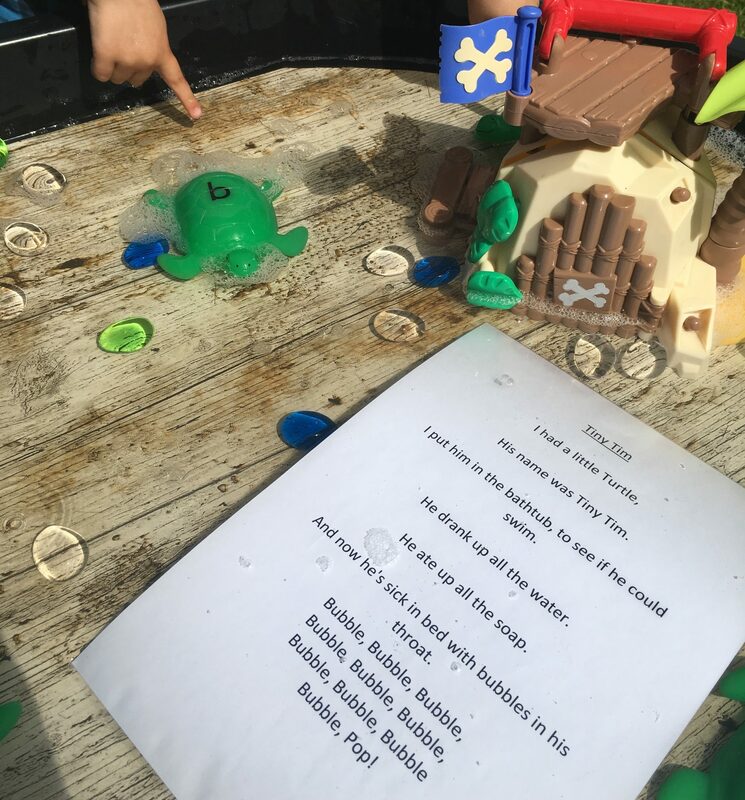 Immerse the turtles in the soapy water and sing the rhyme together. Active World Tuff Spot Tray are great for keeping paint in one area. 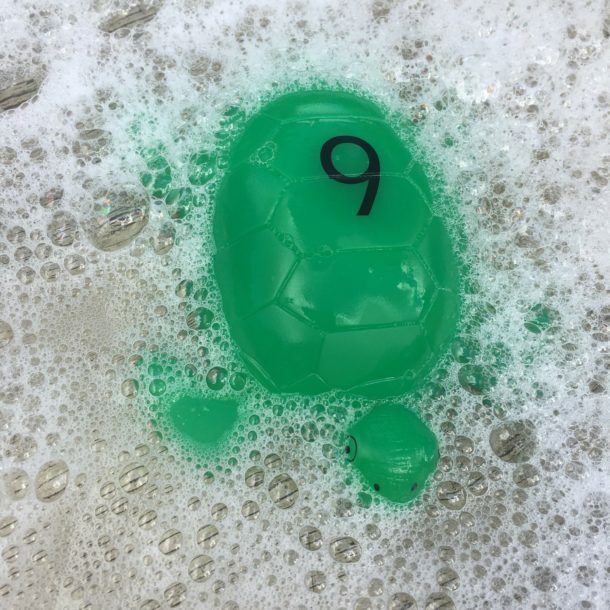 Filling the tray with a selection of different colours and allowing children to use this for foot painting is a fantastic activity, simply make sure you hold their hands so they do not slip. Alternatively using their hands children can make their own marks in the paint and then print their drawings using paper to take home or display. You could incorporate some big art tools to pattern and mark make. 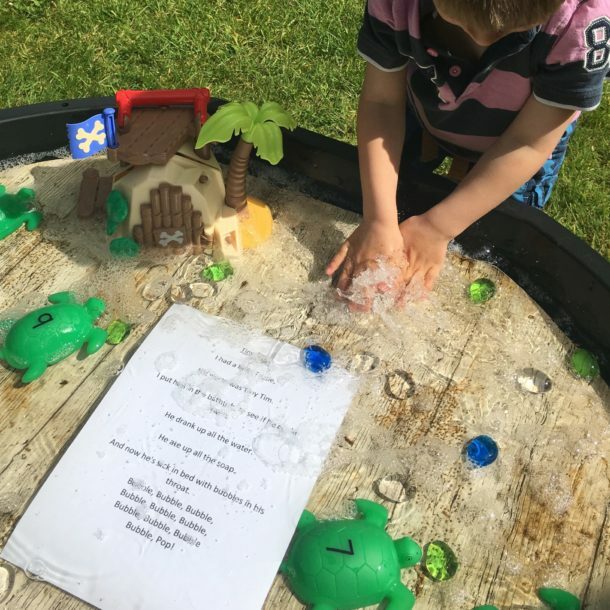 Fill the tray with a variety of items linked to a theme such as Sea creatures or mini beasts and encourage the children to explore and identify what they can see. It is also a lovely idea to fill the tray with items found on the beach, in the woods or in the back garden. Provide magnifying glasses so that the children can look at the patterns and details. These discoveries can help draw out new vocabulary or observations which the children will love to share. 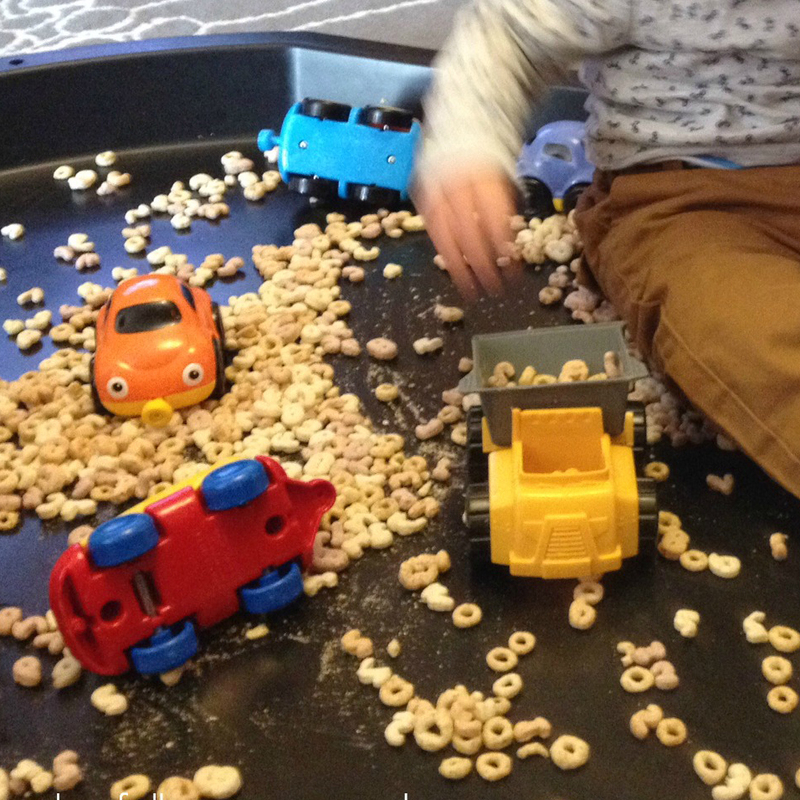 Use the tray for focused activities such as developing fine motor skills. Place cup cake tins in the tray for threading items to be placed into. Select a range of threading resources such as chunky beads, pasta, giant buttons. Provide colourful shoes laces, ribbons and string for the children to choose from. Fill the tray with items like pom poms and tweezers for picking out and sorting exercises, or scissors and a selection of leaves for cutting. 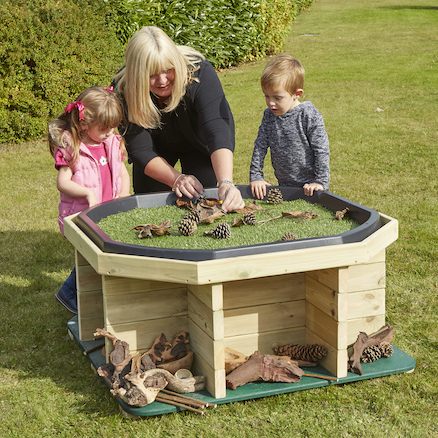 Active World Tuff Spot Trays work well as an area for children to focus. 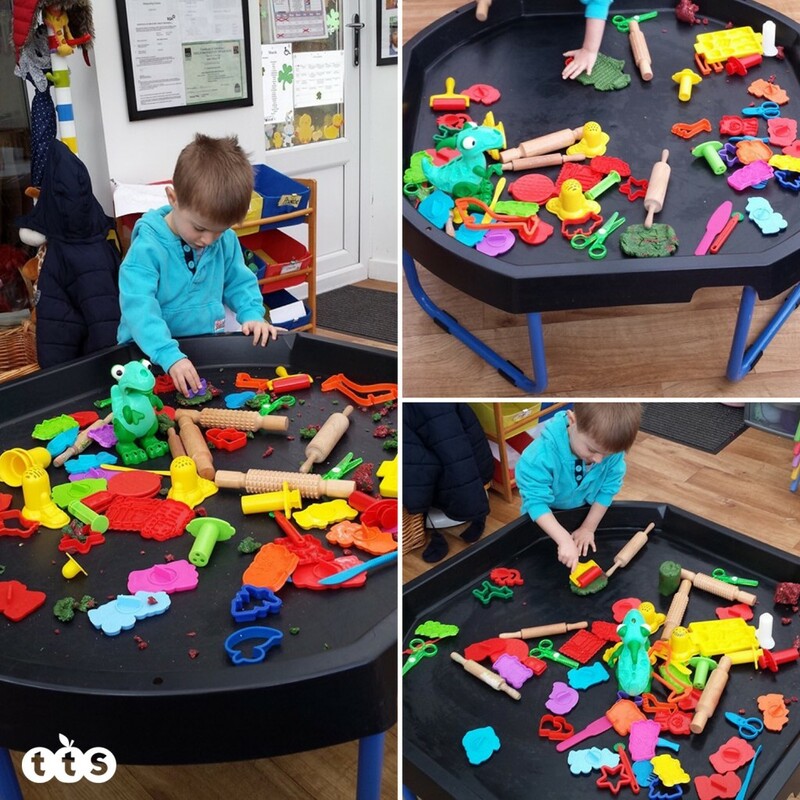 Create themed locations within the tray and place it in the middle of your small group with items to tell a story and enable the children to select which item will come up next in your story, or fill it with items of interest for the group to discuss. Engage the boys (and girls!) 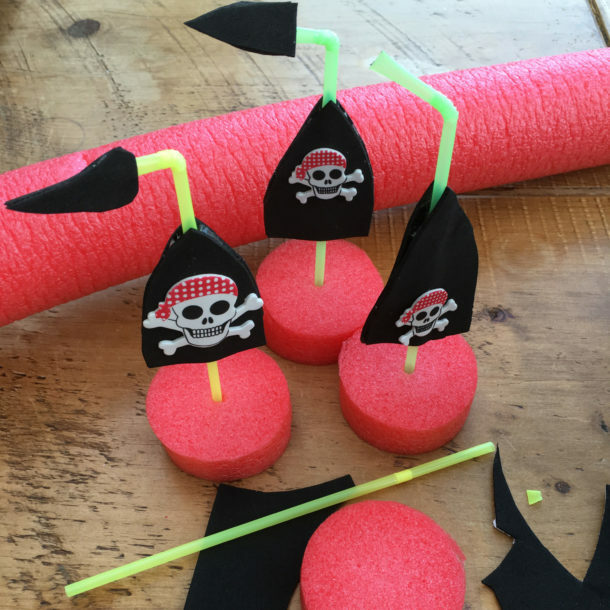 in your setting with a pirate-themed tuff tray incorporating our beautiful potion bottles to make pirate potions and grog! 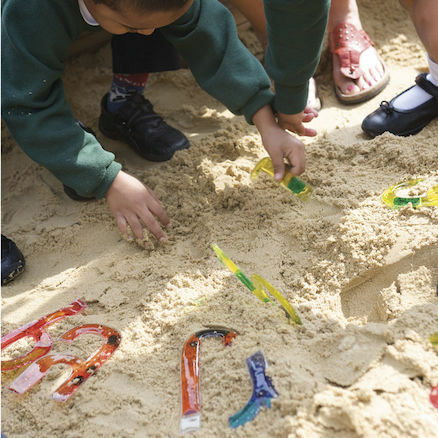 Digging for treasure in sand enables children to count and sort their findings. Try the TTS Metal detectors to search under sand. Use Encourage them to get creative by designing their own treasure maps. Combine this with dressing up and the children will have a fantastic pirate-themed play session! 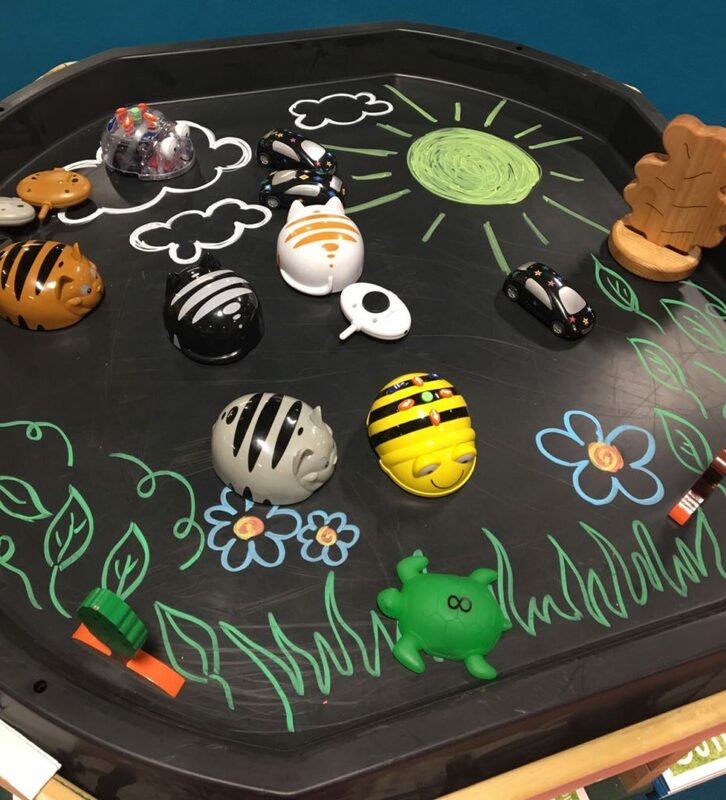 Why not use the tuff spot tray as a track for Bee-Bots, Blue-Bots, or Clever Cats – it will help to contain them whilst the children programme them. 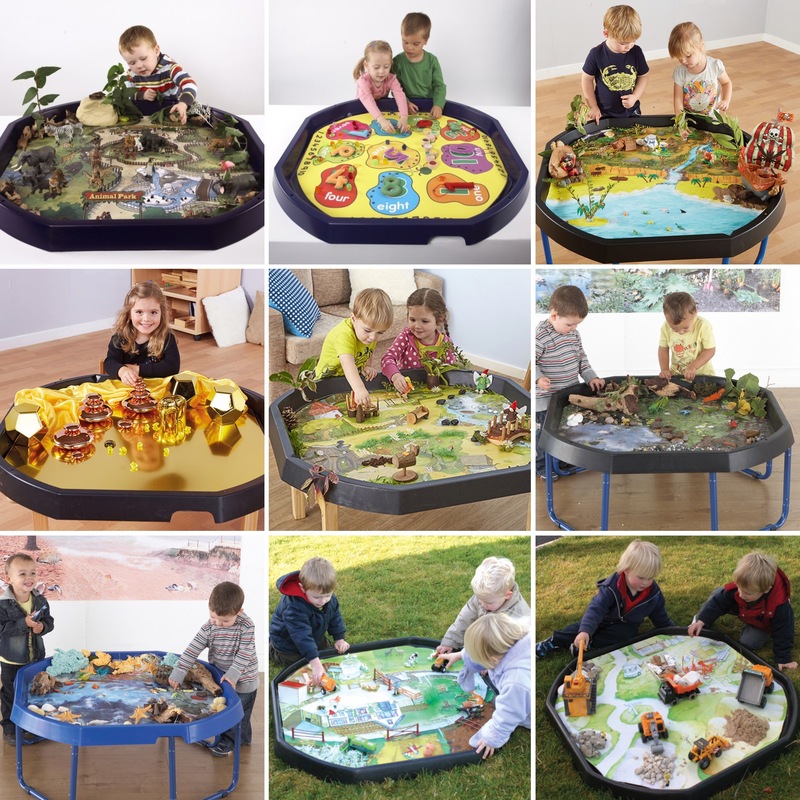 Contain everything that you need for a small group of children in one tray as a group activity. 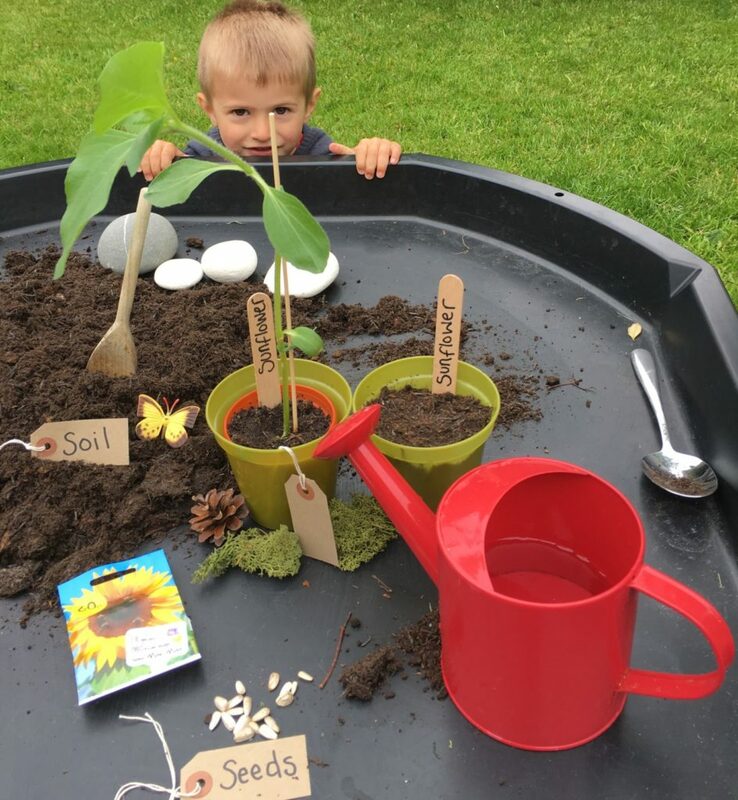 Children can handle all items such as compost and seeds and even create small tags – writing the label themselves. Inspire and engage with each of our 22 mats. Place them in your tray and stand and watch imaginations soar. Children can add all the small world accessories they like. Watch them make towns, jungles, fairy tale landscapes, dinosaur worlds, space scenes and pirate and watery worlds. A fantastic resource. Top Tip: Make your own Tuff Tray mats by cutting patterned fabric or PVC table cloths (from Dunelm or The Range in the UK) to fit the shape. You can get a grass effect, flowers, under the sea, fruit and many more depending on the store. Use a range of Tuff Spot stand from height adjustable stands to more robust wooden stands with either storage underneath or seating so that children can sit down around the Tuff Spot Tray. Do you use Active World Tuff Spot Trays in your setting? 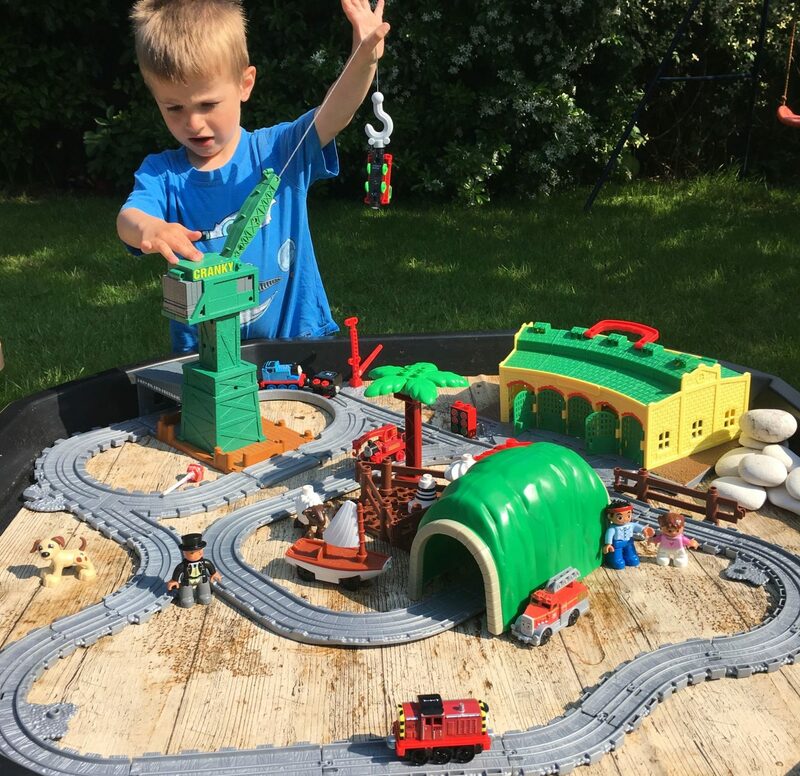 We would love to hear about some of your children’s favourite activity ideas or maybe you have a suggestion on additional resources we could offer. 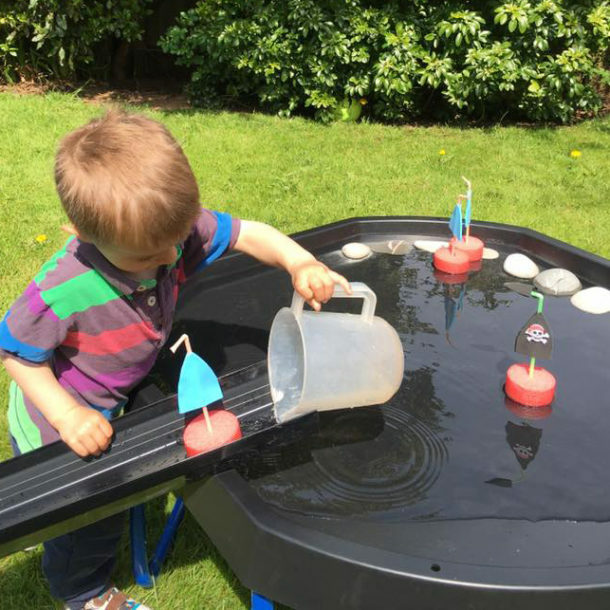 With thanks to Adele Crozier, a nursery manager and blogger from Playful Learners; childminder Gini Hancock, from Giraffy’s Daycare, Charlotte Parry and Clare Wilson, for their imaginative contributions to this article. 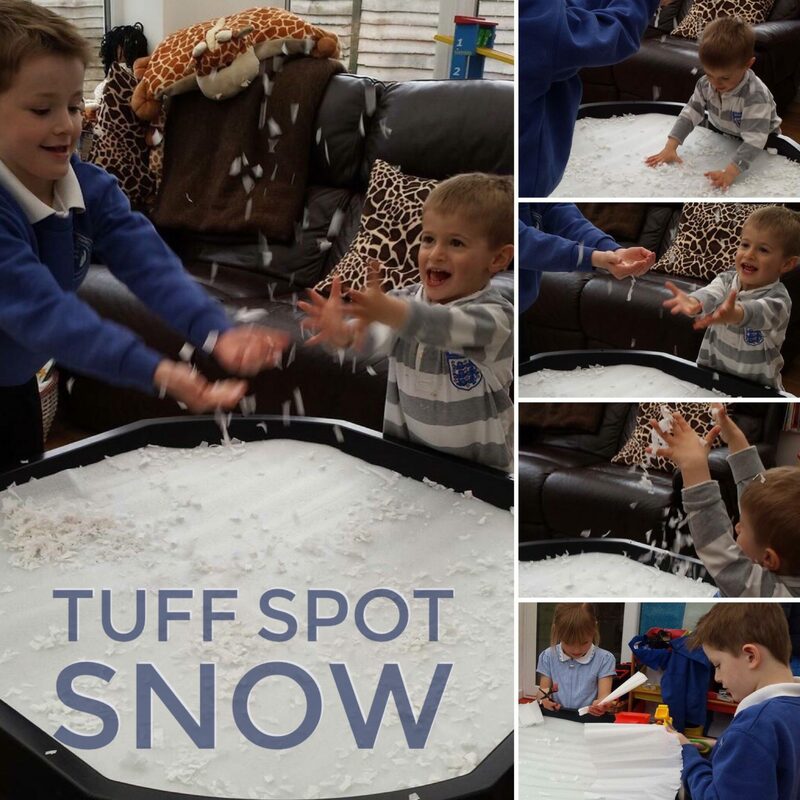 For more Inspiration please visit our Active World Tuff Spot Tray Pinterest Board.